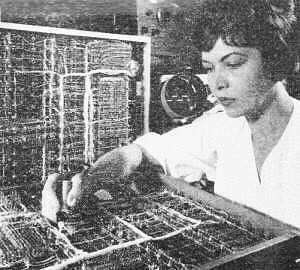 RACEP (Random Access and Correlation for Extended Performance), was an early form of frequency hopping spread spectrum (HFSS) devised by the Martin Company (now Lockheed-Martin). 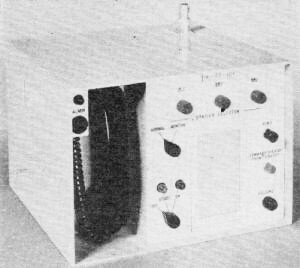 It was used for secure voice communications and worked by sampling speech in small 'slices' and then transmitting each slice modulated onto a carrier whose frequency was determined by a predetermined sequence of center frequencies. A receiver with a matching sequence key would then decode the speech and, with appropriate filtering, reassemble it into its original content. President John F. Kennedy had such systems at his disposal whether on the road or in the Oval Office. General Electric (GE) had a different idea it dubbed 'Phantom' that spread the signal over a very wide bandwidth. Today, we refer to it as Direct Sequence Spread Spectrum (DSSS). Not to be outdone, Hughes Aircraft devised the 'Vocoder,' which is akin to synthesized speech where a series of numbers, each representing a single syllable, is played back sequentially to emulate a human voice. When this article was published in 1962, the required circuitry took up a lot of volume, required a lot of power, and was very costly. Today, an IC for a couple bucks does the job a million times better and consumes a few milliwatts. The latest methods of radio communications defy detection by any listener - friend or foe. Most radio communications systems are like "party lines" - anyone can listen in. 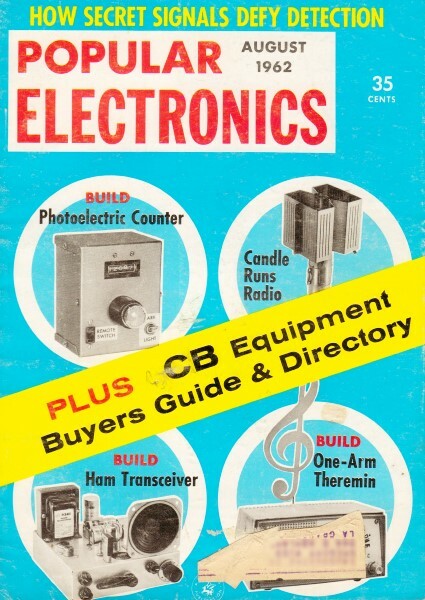 But electronics scientists have been working overtime to come up with the equivalents, radio-wise, for the more desirable (and costly) "private lines." Their objective: to allow our military and government officials to transmit secret information on the air with the full assurance that it can be "received" only by those listeners it is intended for. Perhaps the best known gadget of this kind is President Kennedy's "scrambler." Thanks to this device, the transmitters in his private automobiles and airplanes take his words and turn them into a kind of electronic "hash." Then a special receiver which is set for the right "code" unscrambles the hash and turns it into intelligent speech again. The result is that no unauthorized listener can eavesdrop on the President's conversations. Electronics engineers are coming up with a number of devices to allow "private radio communications. And some of them - already being tested by the armed services - do the job by performing a series of ingenious electronic tricks. RACEP. The Orlando Division of the Martin Company has come up with a system called RACEP (short for Random Access and Correlation for Extended Performance) . One of the more promising schemes to insure secrecy on the airwaves, RACEP is based on a principle that is really quite simple - electronic circuits are capable of switching millions of times a second, but our ears, by comparison, are very slow. Therefore, suppose an electronic circuit were designed to snip tiny samples out of words being spoken. Let's say this circuit takes 8000 such samples every second, and that each sample is one microsecond long. The equivalent of a private telephone system, the Martin Co's RACEP needs no wires or central switching facilities. Another new communications device, Hughes' vocoder, "condenses" speech into basic sounds, reproduces it artificially. The RACEP system transmits during only 1 microsecond out of 125, but its "chopped-up" waveforms contain enough data for accurate reproduction. Pulse-modulated RACEP equipment similar to that shown above handles as many as 70 separate conversations at the same time and on the same frequency. 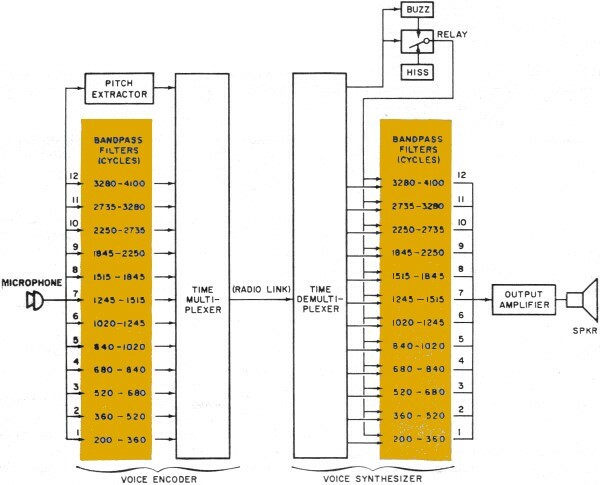 Vocoder transmits up to ten conversations in a bandwidth normally carrying one. If General Electric's "Phantom" were used on the standard broadcast band, its carrier would occupy about the same space as 20 conventional stations. 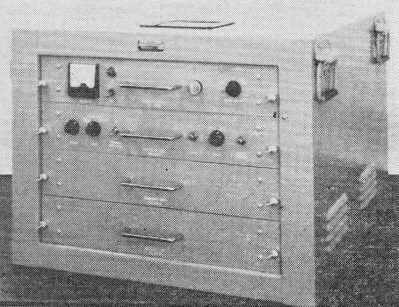 But only a special wide-band receiver specifically "cued" to a particular Phantom transmitter would respond to the broadcasts. Now suppose you're talking by radio and speak a 1-syllable word which has a fundamental frequency of 200 cycles - about average for a man's voice. During one cycle of your voice signal, the sampling circuit will take 40 1-microsecond samples. The pulses generated by this sampling technique will trace out the shape of your voice waveform quite accurately. Using just these pulses, decoding equipment at the receiving end can reconstruct the original 200-cycle voice signal so well that the human ear can't tell it from the original "unsliced" signal. Your voice, in other words, has been transmitted faithfully by a series of pulses. Now, to take it one step further, suppose the transmitter keeps shifting its frequency, so that each pulse is sent out on a different wavelength. A receiver, in order to pick up this tricky signal, must be set to synchronize with the pulses at the proper repetition rate. And, at the same time, the receiver must keep changing frequency exactly in step with the transmitter, so that it's tuned in to each pulse at the right time and at the right frequency. 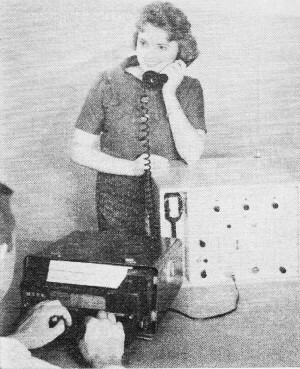 Your words will be heard clearly on this special receiver, of course, but they'd be lost on any radio not set up to receive them properly. Military planners are excited about RACEP because it would be almost impossible for enemy electronics experts - even if they knew the principles involved - to analyze the waveforms and build equipment capable of intercepting and untangling the scrambled RACEP signals. Another big advantage: a RACEP user can call any receiver whose code he knows, simply by setting up his transmitter to broadcast its pulses in that code. Battlefield units could call each other as easily as dialing a telephone. Let's say you want to call receiver 35. Just as you can call a friend on the telephone if you know his number, you could call receiver 35 by dialing its number on your transmitter. The code you dial sets up your transmitter to broadcast a series of coded pulses at a specific repetition rate. Furthermore, each of the pulses is sent out on a slightly different frequency. Each receiver, on the other hand, is set up to receive signals which are broadcast at a predetermined pulse rate and which change frequency in a pre-determined pattern. If you transmit the pulse pattern which receiver 35 is set up to receive, its operator will hear your words as clearly as though you were speaking over a regular radio. Other receivers, not set to detect this particular combination of pulse rate and frequency changes, very likely won't hear a thing. Development engineers at the Martin Company have found that scores of conversations can be going on simultaneously in a band about 4 mc, wide without seriously interfering with each other. Even in such busy systems as air-to-ground radio, each individual is using his radio only a small percentage of the time. Therefore, systems planners estimate that up to 700 receivers could be operating in one area with the RACEP system. Phantom. RACEP isn't the only new communications system. General Electric researchers have come up with an entirely different approach which they call "Phantom." The principle, again, is rather simple. A radio transmitter - one used by a regular commercial radio station, for example - may broadcast on a carrier frequency of 1000 kc. If it broadcasts a 5000-cycle note - about the highest frequency transmitted by most AM stations - this signal modulates the carrier so that the final output signal contains frequencies between 995 and 1005 kc. Engineers call this a bandwidth of 10 kc. (1005 - 995 = 10 kc.). Your receiver has a bandpass of about 10 kc., too. As you tune across the dial, you shift the position of this bandpass. When you tune to 1000 kc., the bandpass is centered around this frequency so that you receive all frequencies between 995 and 1005 kc. and thus hear the program the station is transmitting. The Phantom system, however, would stretch the audio signal over an extremely wide band of frequencies - perhaps 200 kc. or more. 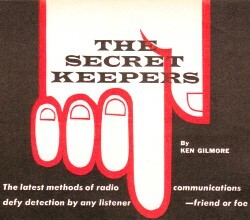 The transmitted signal, then, would cover a band of frequencies from 900 to 1100 kc. Since it is spread over such a wide area, only a tiny fraction of the signal would fall within the bandpass of an ordinary receiver. It wouldn't be possible to tune in on the wideband Phantom signal simply by having an extra-wideband receiver, either. If you had this kind of setup, a jumble of stations broadcasting on frequencies within the band You were covering would come tumbling in. To get around this problem, Phantom designers "tag" the transmitted signal with a special waveform. The Phantom receiver lets in only signals which are identified by this waveform and rejects all others. You may have heard Phantom broadcasts without knowing it. General Electric has transmitted Phantom signals more than 2000 miles across the country to test the system. Because this special waveform is spread over such a wide frequency band, its amplitude in the bandpass of any normal receiver is very low - so low that you wouldn't notice it even if you happened to be tuned in somewhere on the broad band of frequencies across which the Phantom signals go skittering. And if your receiver were sensitive enough to hear the Phantom signal, you would probably think it was just ordinary static! Incidentally, GE engineers who didn't know the exact waveform tried to intercept the messages during the test transmissions, just to see whether an enemy could break the "code." The results: they couldn't. Said one, "It's like a combination lock. Even if you know the principle on which it works, that doesn't mean you can open it without knowing the combination of the particular lock you want to open." Phantom systems can use literally thousands of "combinations" or special identifying waveforms, and they can also change from one to another rapidly. Thus, even if someone happened to stumble on the code accidentally - about as likely as opening a combination lock by chance-it wouldn't do him much good. Next time he tried, the combination would have been changed. Vocoder. Engineers at Hughes Aircraft have come up with still another way to transmit messages secretly, although the gadget they use to do it wasn't originally developed for that purpose. Their basic approach, as a matter of fact, isn't even new. Back during the 1930's, Bell Laboratories scientists built a gadget they called a "vocoder." It consisted of a cabinet full of sound generators, filters, and other circuitry, and it was designed to create a reasonable facsimile of the human voice. If you turned on the right combination of circuits and did it fast enough, the vocoder produced a series of speech-like sounds. These electronically generated words were quite intelligible. In fact, Bell's vocoder created a sensation at the New York World's Fair in 1939, where an operator played it from a keyboard much like that on a piano. By pressing the right combination of keys in the right sequence, he could make the vocoder "speak" whole sentences. Hughes' entry in the secrecy sweepstakes makes use of the old vocoder principle. Essentially, the spoken words to be transmitted are fed into an analyzing circuit which determines several important characteristics of the various sounds which go to make up each word - pitch, intensity, and so on. This information, electrically coded, is sent on to a receiver, which, much like the earlier Bell Labs unit, turns these signals into intelligible speech. The voice signal to be transmitted is applied to the inputs of a series of 12 bandpass filters. The output of each filter is determined by how much sound energy the word or syllable being spoken contains in that particular frequency region. Since the outputs from these circuits are rectified, the sound energy going through a particular filter shows up as a d.c. voltage. The louder the sound applied to the input of any specific filter falling within that filter's frequency range, the higher the voltage at the out­put of that filter. naturally sounds somewhat different than the original voice, but it is still intelligible. A final circuit - called the pitch extractor - finds out two things. First, it determines the presence or absence of pitch. And second, if sounds with a definite pitch are present, it determines their frequency. By way of explanation, a vowel - an "a," for example - is produced when our vocal cords generate a sound of a certain frequency. A consonant, on the other hand - such as an "s" - is a less specific sound (a hiss, in this case), requires no movement of the vocal cords, and is at no particular frequency. At the receiving end, a time de-multiplexer splits up all of the signals again and sends each one to its proper circuit. The signal from the pitch extractor is applied to a relay, which turns on one of two circuits. If there is no pitch present at the transmitter, the relay turns on a "hiss generator" which produces white noise. If pitch is present, the relay activates a "buzz generator" which puts out a sound rich in harmonics and similar to that produced by the human larynx. The buzz generator operates at the same fundamental frequency that the pitch extractor detected in the speech at the transmitting end. Now, either the hiss or the buzz (depending on which one happens to be present at any given moment) is applied to the inputs of all the bandpass filters in the receiver. Suppose. at one particular moment, that the person back at the transmitter is saying "a." The fundamental frequency of his "a" might be 300 cycles. His particular voice quality - the characteristics of his voice which allow his friends to distinguish his speech from someone else's - is determined, among other things, by the relative strengths of the various harmonics of this basic 300-cycle tone. Let's say. for example, that the second harmonic-600 cycles - is twice as strong as the fundamental, and that the third harmonic - 900 cycles - is half as strong as the fundamental. Again, for the sake of illustration, let's say that bandpass filter No. 1 at the transmitter has put out a signal of 4 volts, corresponding to the intensity of the 300-cycle fundamental. Bandpass filter No.3, carrying the second harmonic, would have put out a signal twice as large - 8 volts. Filter No.5, transmitting the third harmonic, would have produced only 2 volts. At the receiving end, these signals of varying strengths are applied to corresponding filters. Number 3, then, amplifies the output of the buzz filter - which, you'll remember, is operating at the same 300-cycle fundamental - twice as much as number 1 and four times as much as number 5. The result is a sound very close to the original "a" spoken into the transmitter. Normally, communications channels such as those used by the military, commercial airlines, and so on, are some 3000 cycles wide - about the same as a telephone channel. With the vocoder, about nine conversations can be squeezed into the band space usually taken up by only one. As you may have guessed, digital operation gives the vocoder several outstanding advantages. First, it can operate reliably in the presence of tremendous amounts of interference - amounts which would paralyze an analog system; consequently, a digital system is far harder to jam. Second, signals from a digital vocoder can easily be encoded - by turning them into a kind of electronic "hash" something like that used with President Kennedy's scrambler. Then, a special unscrambler at the receiving end turns the scrambled signals back into words. To anyone listening without an unscrambler set specifically for the message being transmitted, the signal sounds like pure gibberish. Thus, with such tricky electronic devices as these, our military forces and government officials can have all the advantages of radio's instant communications. And they can also have another advantage that radio has seldom offered - the assurance that their messages have traveled through the ether in such a manner that only the persons they are intended for will ever know what they were all about.